OK, so, how cool is this? If you’re into trivia (like me), and you’re into guitars (like I am), then the poster below is your dream come true. 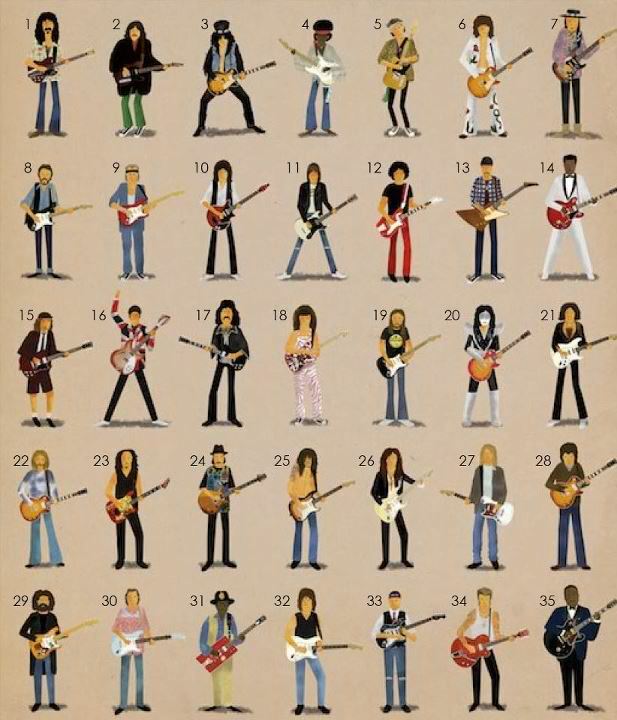 Basically you have to identify each guitarist, and, well, that’s pretty much it. But before you attempt to name the guitar-wielding heroes below, remember to gather amongst your guitar nerd friends to play the guessing game collectively. It is WAY. MORE. FUN! Alright, go! And write your answers in the comments section below. I will post the correct answers on Aug. 26. Illustration by Max Dalton. If you Google him to look up the answers, then you are c.h.e.a.t.i.ng.! 30. Joe Walsh or Ry Cooder? can number 5 be Mark Knopfler? Kirk Hammett and Kurt Cobain are there but Steve Howe is missing? Why in the hell is this guy missing?? He inspired most on this list!! No Pauline you're not superwoman, and you damn sure wouldn't know a great guitarist from shin-ola. How dare you forget Joe Walsh, Warren Haynes, Derek Trucks, Larry Carlton, Steve Howe, the late great Tommy Bolin, just to name a few. Now you other dummies Tom Morello is a partially Black American with Black features. Number 2 is the one and only, late great George Harrison ( for you young numb-nutted brain idiots Mr. Harrison was a Beatle, git it ? ), Lord love a duck. Pfft. Jack White couldn't carry Brian May's guitar pick, are you for real ? Get those I-Pods out'cha ears, stop texting, and playing violent enhanced video games on your PC's. Read a book, and that's a triple dog dare. last, but not least, do not attempt any kind of guess who, or guess what quiz's from anyone. As the Eagles sang, figure out the big picture and if that don't do it, then get over it. I'm embaressed to call you people smart peers ? ?